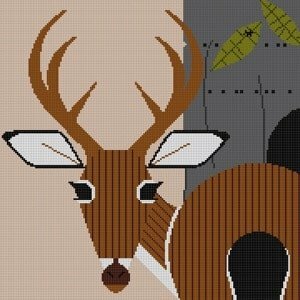 The Key Deer design is hand painted onto 18 mesh Mono needlepoint canvas. The abstract, graphic design features a deer peering at the stitcher in a subdued background. The needlepoint design area measures 10" x 10". This Charley Harper Key Deer needlepoint is sold canvas-only or as a kit. We use DMC embroidery floss if cotton is selected, Bella Lusso for wool and Pepper Pot for silks. If you require stretcher bars to hold your canvas taut while you stitch we recommend two pair of 14" and some thumb tacks. This Key Deer Charley Harper needlepoint canvas usually ships in 7-10 days. You can always check availability before you order. Contact us with questions about Charley Harper needlepoint.